Looking back over 20 years, what now seems inevitable, at the time seemed unthinkable. CBS News correspondent Mark Phillips reports that the Berlin Wall was the fault line between the world's communist east, and the free west. Twenty years ago Monday, it came down, and a big party has been organized to celebrate the anniversary. A new wall, erected to mark the occasion, will come down a lot easier. Huge foam dominos, decorated by German school children, have been set up where the Berlin Wall used to stand. They'll be knocked over 20 years, to the hour, after the real wall was finally breached. The spectacle has attracted large crowds; from the old, coming to recall that heady and shocking time twenty years ago, to some younger visitors who never even knew the wall, but who are getting a pretty good history lesson. No one had planned what happened that night. Crowds from East Berlin swarmed toward the wall when the then-East-German Government announced it was finally going to lift travel restrictions. The numbers proved too great and their enthusiasm too strong for the East German Border guards, who had shot as many as 200 people attempting to escape over the years. The guards simply melted away, into the crowd. The scenes that night were the beginning of the domino effect of communist governments falling across Eastern Europe. German Chancellor Angela Merkel, herself born in the east, will welcome world leaders to Berlin on Monday to commemorate the event. Secretary of State Hillary Clinton is representing the United States. Britain, France and Russia, the other former occupying powers, will be represented by their heads of government. 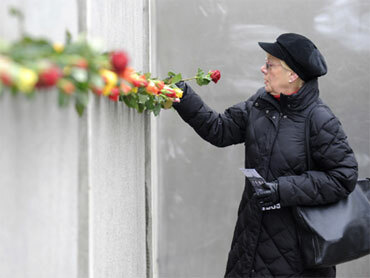 That one night, twenty years ago, changed Berlin, Germany and the entire world, forever.